Before our epic Christmas surprise trip to New York City, Olivia and I had been to New York City twice. Each time we visited the typical touristy attractions, and even caught a Broadway show. Since then we’ve been back to NYC several times and have learned to explore the city more like natives. One gem we found was the National Museum of Mathematics (MoMath). We had a great time visiting and these 7 insider tips will ensure you do too. Whether you’re traveling to the city or you live there, visit the website and buy your tickets online. The online ticket price is less expensive. Also, there are a limited number of tickets made available each day. So pick your day and purchase early. Alexandra picked up our tickets that we ordered online. The website contains a list of special events being held at the museum. Be sure to check to determine if those activities will be a good fit for your family. We were just a few days too late to enjoy the Pi Day activities, but I’m sure the crowds were bigger on that day. Located on the north edge of Madison Square Park, MoMath is easily accessible by public transportation. There are several subway stations within a couple of blocks and a few busses that route down Madison Avenue. If you choose to drive, search for parking on the MoMath website directions page. We were able to find 12-hour parking for $11, which for our family of 4 was cheaper than taking the subway. MoMath is open 7 days a week, 364 days a year, closing only for Thanksgiving Day. In true form to a place devoted to math, they are strict about not going over capacity for the museum. Also, as the day goes on the museum gets more crowded and the more popular attractions will have longer wait times. We arrived at 10:45 AM and enjoyed the attractions with smaller crowds until about 1 PM. 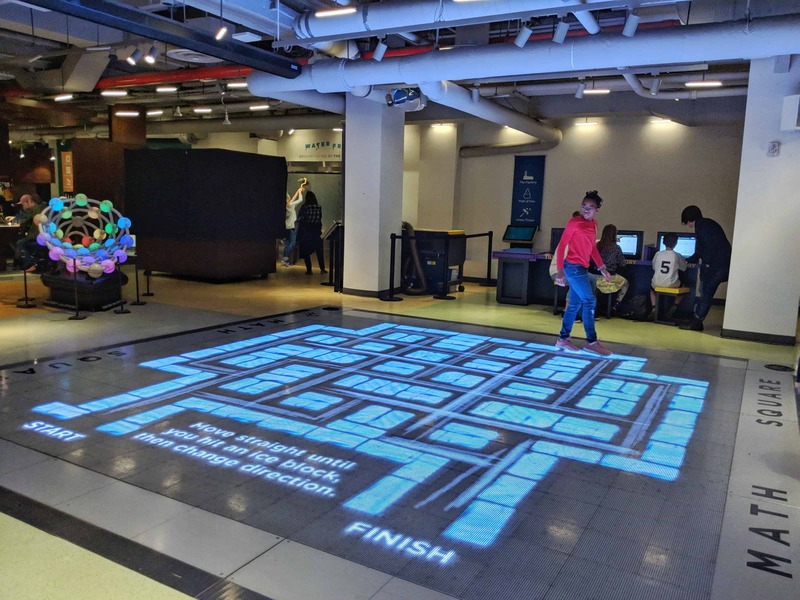 There are over 40 exhibits and attractions at MoMath. To experience them all, you can spend the entire day exploring and solving the puzzles on both levels. You will want to plan a food break. There is no food or drink allowed inside the museum, but within two blocks there are many restaurants – both local cuisine and national chains. Stop by the desk and leave your tickets to hold your place while you grab a bite. Olivia working desperately to beat her Dad’s score. From the pi shaped door handles to the math based comic strip gallery, everything at MoMath is founded in mathematics. S, of course,e they couldn’t let you leave without challenging your aerodynamic skills. In order to leave the museum, you must drop your ticket into the clear tower. Inside the tower in a smaller box with a similar open as the tower. If you can get your card inside the inner box you win a prize. Who isn’t going to try that? The exit for the museum is through the gift shop. Very smart. But, if you find a particular exhibit or puzzle you enjoyed, stop in the gift shop and take one home. I should have bought one of these for Harold. The gift shop is also where you pick up your prize if you win the ticket drop game at the end of your day. Have you ever been to the National Museum of Mathematics? Are you planning a trip? What other tips do you have to share?